1 of 4 Place chicken pieces in a large resealable plastic bag. In a medium-size bowl, whisk together vinegar, Worcestershire and Adobo. Add oil, whisking until well blended. Add to chicken in bag and seal. Turn bag to coat chicken; marinate in fridge 1 hour. 2 of 4 Heat gas grill to medium-high heat. If using charcoal grill, stack coal on one side of grill and light fire. 3 of 4 Once grill is heated, clean grate with wire brush. Place chicken, skin-side down, on grill (if using charcoal, place directly over coals). Cover and cook 5 minutes. 4 of 4 Open grill; Turn chicken pieces over. 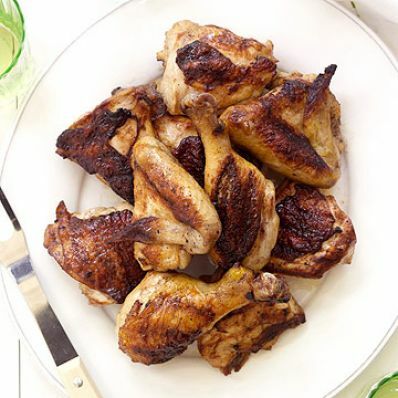 On gas grill, reduce heat to low; for charcoal grill, move chicken to side of grill so pieces are not directly over coals. Continue to cook chicken an additional 20 to 25 minutes, covered, turning occasionally. Check internal temperature of chicken; thickest part of breast should register 160 degrees (temperature should rise to 165 degrees as it sits). Remove chicken to platter. Let rest 5 minutes.